How do you control dandruff naturally? Dandruff is caused by a fungus like Malassezia or yeast feeding on an oily scalp. So, the easiest remedy for dandruff is killing the infection that is causing the it. Using ginger for hair is one of the most time-tested Indian Practices because it’s one of the best remedies for dandruff. Why? It is a natural antiseptic and keeps the yeast infection at bay, and your scalp squeaky clean. Mix 2 tbsp of grated ginger with 2 tbsp of coconut oil. Add a dash of lemon juice and mix. Apply and leave this mix in for 30 minutes, then rinse your hair as usual. Repeat this thrice a week. Who would’ve thought that you could learn how to control dandruff with a routine kitchen ingredient like ginger. 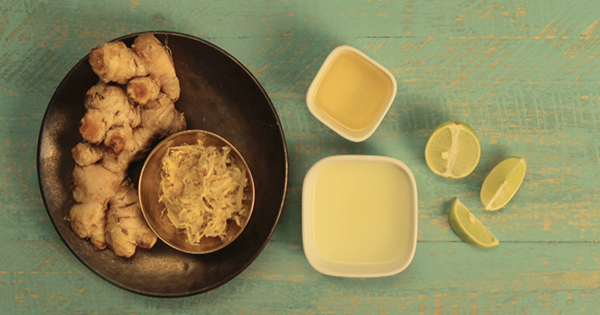 Discover other ingredients like ginger for your hair, here.